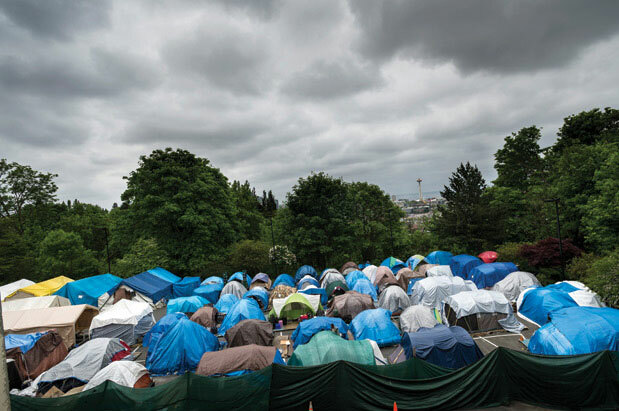 Friday morning, between 2 and 6am, nearly 1,000 volunteers spanned across King County for Count Us In 2019, the annual Point in Time Count of individuals experiencing homelessness, coordinated annually by All Home. The unsheltered street count was conducted as a full canvass of all 398 census tracts in King County. Count teams included community volunteers as well as guides with current or prior experience of homelessness, who were compensated for their time, to offer their expertise and knowledge for a more informed and respectful count. “Joining a thousand volunteers for this year’s Count Us In is inspiring,” said King County Executive Dow Constantine. “The annual snapshot-in-time count provides us with useful data that will guide the work we and our partners do as a region to confront the homelessness crisis. And, it demonstrates that the people of King County are united to ensure that all of our neighbors have a safe, warm, and dignified place to call home." The full range of count activities includes the street count of people living unsheltered, a count of people living in shelter and transitional housing, and a qualitative sample-based survey of people experiencing homelessness. Local advocates, individuals with lived experience of homelessness, service providers and Applied Survey Research (ASR), a Bay-area research firm contracted to help conduct the Count, have all been active and valued partners in the planning and implementation of Count Us In 2019. While the Count’s core purpose is to collect data on the needs of people experiencing homelessness, it also provides an excellent opportunity to increase awareness and spark action. A successful and accurate Count is an essential component to informing local strategies to address homelessness and to making homelessness rare, brief and one-time. Data collected year-round in the Homeless Management Information System (HMIS) shows that the need for housing assistance in King County has grown consistently over the past five years, with more than 30,000 individuals entering the homeless system over the course of a year. This reflects years of diminishing affordable housing capacity in the region, similar to many other rapidly-growing areas across the country and emphasizes the need for comprehensive prevention strategies that prevent the experience of homelessness in the first place. Point In Time counts are a requirement for communities that receive federal grants from the U.S. Department of Housing and Urban Development (HUD). Data collected from Point In Time counts across the nation are published on the HUD Exchange website and presented annually to Congress as part of the Annual Homeless Assessment Report (AHAR). A comprehensive report of Count Us In findings, including data on youth, vehicle residents, chronic homelessness and other specialized populations will be available in May of 2019. “We don’t need to know the exact outcome of the count to be reminded today that the experience of homelessness is far too common in a community with such prosperity and opportunity. This reality is an important call to action for the days and months ahead, knowing that we not only need to respond to those in crisis tonight, but must also come together as a community year-round to prevent the experience of homelessness whenever possible.” said Kira Zylstra, Acting Director of All Home. To learn more about Count Us In, visit the website, sign up for the newsletter and follow on Facebook and Twitter.